Watching plants return to life after a spell of cold winter weather can seem like a miracle. For over a century, biologists have understood that plant survival depends on a variety of co-dependent mechanisms, yet their methods for coping with temperatures far below freezing are still poorly understood. Dr David Livingston and Dr Michael Wisniewski of the US Department of Agriculture have provided fresh insights into these mechanisms, with the help of remarkably intricate imaging techniques. In temperate climates, many actively growing plants are not adapted to long periods of freezing weather, and will typically die if they freeze or remain frozen for too long. This isn’t always the case though – over centuries, farmers have gained a deep knowledge of which crops they are able to plant over the winter. Grains such as wheat, and root vegetables, are ideal candidates, and have ensured the survival of many civilizations over harsh winters. However, as the Earth’s climate changes, the ability of plants to adapt is becoming more complicated. Increasingly frequent weather extremes mean that periods of warmer weather, particularly in late winter and early spring, are increasingly interspersed with harsh cold snaps, pushing the coping mechanisms of winter crops to extremes – a cause for concern for farmers. One solution to this problem could lie in the breeding of better adapted varieties. Studies have revealed that different varieties of crops resist freezing in different ways. While some may ensure their seeds remain alive over winter, others will see their leaves and shoots coming back strong after being frozen. Yet in order to breed crops with multiple mechanisms for tolerating freezes, a detailed knowledge of the freezing process in plants is needed. In their recent research, Dr David Livingston and Dr Michael Wisniewski of the US Department of Agriculture – Agricultural Research Service have focused on gaining an in-depth understanding of how different plants and crop varieties resist freezing. They hope that this information will allow breeders to select new varieties that can more readily tolerate extremes in climate. In 2015, Drs Livingston and Wisniewski, along with other colleagues, used a high-resolution infrared (IR) camera to precisely document the overnight freezing processes that occur in crops during a frost event. By measuring subtle changes in heat emitted by the plants, the camera enabled them to gain greater insights into freezing processes under natural conditions than had previously been achieved. 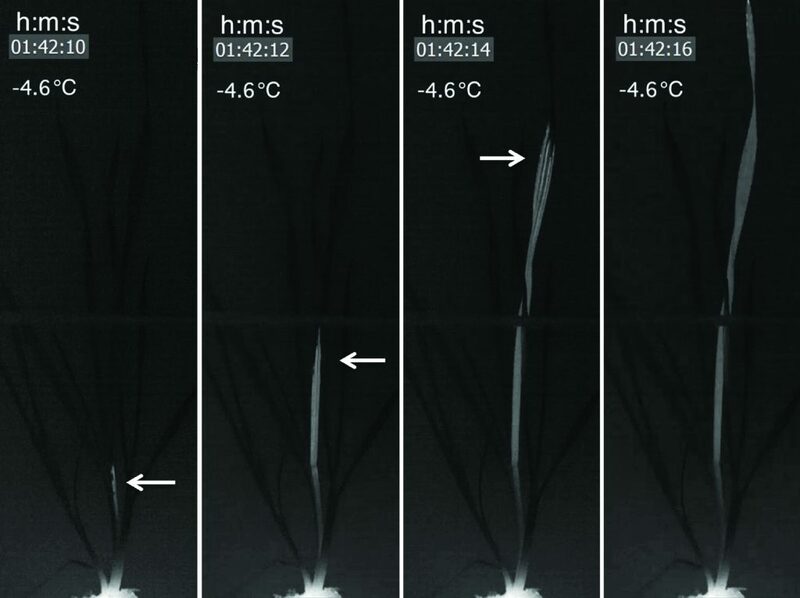 In a laboratory study, the IR camera was used to create a series of videos of winter wheat under controlled conditions, subjected to temperatures as low as −18°C. In 2017, the laboratory studies led Dr Livingston and Dr Wisniewski to monitor wheat plants under a natural frost event in which the temperatures dropped to about −8°C. In both experiments, the videos revealed a wide range of freezing phenomena that had never been observed previously. Thanks to the use of this technology, biologists now have a more in-depth understanding of the freezing responses that occur in plants under laboratory and natural conditions. 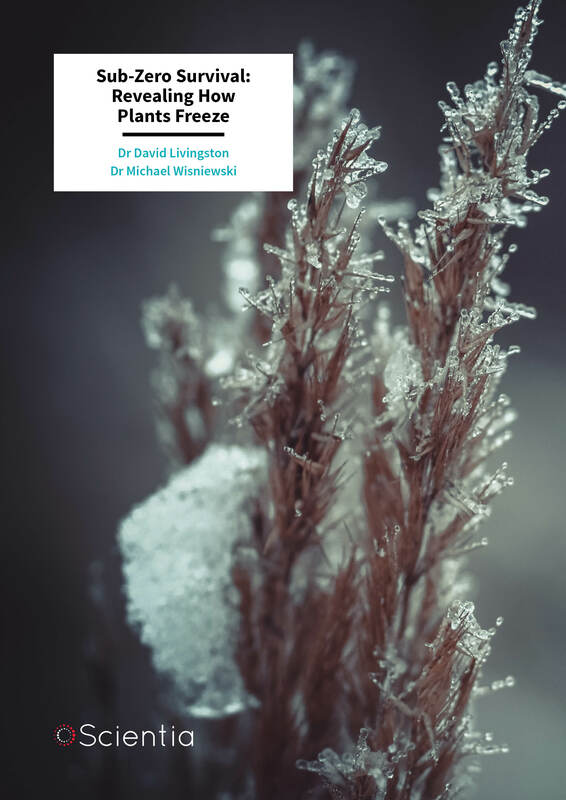 One of the most fascinating phenomena demonstrated by Dr Wisniewski, Dr Livingston and their colleagues was the ability of certain parts of wheat, and indeed entire plants, to avoid freezing at sub-zero temperatures. This process is called supercooling and allows plants to avoid freezing injury. Drs Wisniewski and Livingston realised that supercooling plays an important role in winter survival, and emphasise how an advanced understanding of supercooling could greatly assist in the breeding of winter hardy crops. For example, some crop species will survive winter by supercooling, while others will tolerate freezing and survive winter temperatures quite easily, as long as the temperatures don’t drop too low or stay low for an extended period of time. ‘The goal of our program is to identify the mechanisms used by plants to survive freezing so that breeders can incorporate those mechanisms in existing crops and improve their tolerance to freezing temperatures,’ Dr Livingston explains. But as the researchers discovered, genetics is not the only factor that determines freezing responses. By taking the first high-resolution videos of crops freezing under natural conditions, the team’s research inevitably led to observations that contradicted previous ideas about freezing patterns. For example, they observed that the order in which individual plants freeze within a group of plants of the same crop is far less predictable than biologists had believed. Dr Wisniewski and Dr Livingston propose that heat rising up from the soil had an effect on the unpredictable order of freezing. In greater detail still, the images revealed the progression of freezing throughout individual plants. ‘Freezing always began at the base of the plant and progressed to the top, even though the tops of plants were colder than the base,’ adds Dr Livingston. An additional important aspect of winter survival revealed by the IR camera was that the process of freezing itself does not necessarily kill plant tissue. In reality, the situation is more complex because freezing takes place in three distinct stages. So ultimately, in some tissues freezing itself is not a death sentence, as long as it does not progress to the third stage. ‘Microscopic observation suggests that death from stage three freezing is a result of the separation of the outer layer of cells from inner tissue cells after thawing and not from rupture of cells during freezing,’ explains Dr Livingston. If the plant manages to thaw out before this level of damage occurs, the plant will have a good chance of surviving and recovering. This insight could be vitally important for breeders wishing to develop freezing-resistant crops through selection. A single leaf freezing on a wheat plant. Note that freezing begins at the bottom of the plant and progresses to the top. Plants in the laboratory and in the field always froze from the bottom up even though the tops of the leaves were always colder than the bottom. As the Earth’s climate becomes increasingly unpredictable, Dr Livingston, Dr Wisniewski, and their colleagues believe their work will be vital to understanding how agricultural practices will need to adapt to more frequent weather extremes. ‘If, as expected, temperatures during winter and spring become more and more erratic, resulting in temperature extremes at unpredictable times, it will be essential to have a correct understanding of how freezing begins and propagates in plants so that logical approaches to improving freezing tolerance can be developed,’ says Dr Livingston. Dr David Livingston works as a USDA Research Agronomist and Professor at North Carolina State University investigating the physiology of freezing tolerance in grain crops. 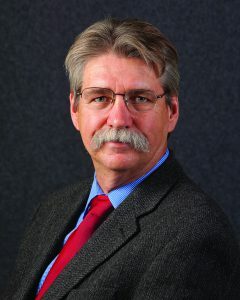 He obtained his PhD at Michigan State University and worked for the USDA at Penn State University as an oat and barley breeder with a focus on improving freezing tolerance. He was transferred to Raleigh North Carolina in 1994, focusing on tolerance of wheat to spring freeze events using infrared thermography. Dr Livingston is now working with collaborators to combine infrared observations and 3D reconstruction, helping breeders to select individual freezing tolerant plants more effectively. 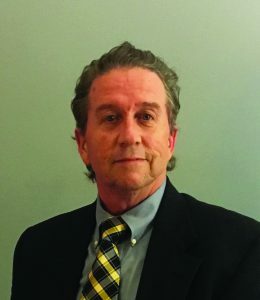 Dr Michael Wisniewski completed his PhD in Botany and Plant Pathology at the University of New Hampshire in 1983, before becoming a Research Plant Physiologist at the USDA’s Appalachian Fruit Research Station. He is now the Supervisory Lead Scientist at the station, where his research interests include the stress physiology of fruit trees, cold hardiness and frost protection, and biological control of postharvest diseases. As well as being awarded several patents for his agricultural innovations, Dr Wisniewski has achieved many awards for his research, including the American Horticultural Society’s Outstanding Researcher Award in 2011. DP Livingston, TD Tuong, JP Murphy, LV Gusta, I Willick, ME Wisniewski, High‑definition infrared thermography of ice nucleation and propagation in wheat under natural frost conditions and controlled freezing, Planta, 2018, 247, 791–806. DP Livingston, TD Tuong, TG Isleib, JP Murphy, Differences between wheat genotypes in damage from freezingtemperatures during reproductive growth, European Journal of Agronomy, 2016, 74, 164–172. M Wisniewski, L Gusta, G Neuner, Adaptive mechanisms of freeze avoidance in plants: A brief update, Environmental and Experimental Botany, 2014, 99, 133–140. DP Livingston, TD Tuong, GE Kissling, JM Cullen, Visualizing surface area and volume of lumens in three dimensions using images from histological sections, Journal of Microscopy, 2014, 256, 190–196. DP Livingston, TD Tuong, Understanding the response of winter cereals to freezing stress through freeze-fixation and 3D reconstruction of ice formation in crowns, Environmental and Experimental Botany, 2014, 106, 24–33. LV Gusta, M Wisniewski, Understanding plant cold hardiness: An opinion. Physiologia Plantarum, 2013, 147, 4–14. ME Wisniewski, LV Gusta, MP Fuller, D Karlson, Ice nucleation, propagation and deep supercooling: the lost tribes of freezing studies, In: LV Gusta, ME Wisniewski, KK Tanino (Eds. ), Plant Cold Hardiness: From the Laboratory to the Field, CAB International, Cambridge, 2009, 1–11. 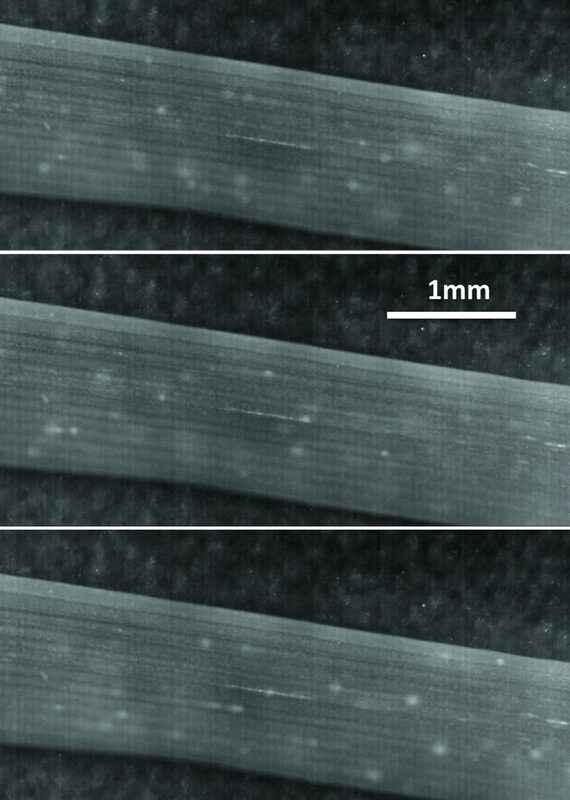 M Wisniewski, BM Glenn, MP Fuller, Use of a hydrophobic particle film as a barrier to extrinsic ice nucleation in tomato plants, Journal of the American Society of Horticultural Science, 2002, 127, 358–364.